It’s always a bitter pill to swallow whenever your franchise player signs elsewhere in free agency. The Cavaliers felt the knife piercing through the heart when Lebron had his personal life decided live on ESPN at his boys and girls basketball camp while being interviewed softly by ESPN’s Jim Gray. Totally ESPN and Jim Gray’s idea to have that televised by the way, Lebron’s agent Maverick Carter thought it would be a good way to raise money, ESPN just wanted it for the views. Thunder fans ( and Russell Westbrook) felt betrayed after KD decided he wanted to play for the team that was just one loss away from seeing Kevin Durant’s Thunder in the finals from home, and while not as impact or sudden, Paul George could leave the Thunder for his LA Lakers come this spring/summer. Something felt not the same though with how Gordon Hayward Left the Utah Jazz. This was a team and a franchise that was just growing to it’s best form in a crowded and loaded Western Conference, and they were maturing the natural way with homegrown picks, that eventually would grow into franchise players in Rudy Gobert and Gordon Hayward, and surround them with good enough veteran players that would help complement the Offense run by solid head coach Quinn Snyder. In a time where players have as much opinion and freedom to go wherever they want to, the Jazz for the most part were able to stick together and remain as close a group as you see in the NBA. So when Gordon Hayward was signed to the max $148 million dollar deal for 4 years, it was a sudden halt in the development and improvement of the Jazz who were just starting to show its true potential. Having Gordon Hayward reunite with his college coach in Brad Stevens makes sense, and he can help lift a Boston Offense that struggles at times, sitting at 16th in OffRTG (104.3) and True Shooting Percentage (55.1%). But for Utah it means leaving the player who has been through the bad times, and was the leader when they started to build up their young roster. The Jazz were now more steps back than forward at the point of the 2017 NBA Draft, and needed to be within a decent position at the Draft so that they could find another peice that they can keep and help mold. Luck eventually was placed in General Manager Dennis Lindsey and his team, and they drafted athletic dunking stud Donavan Mitchell with the 13th pick. It helped fill out the wing starting spot lost when Hayward left, and it gave the Jazz another exciting and athletic player alongside Rudy Gobert. It may not be an immediate replacement for Hayward, but they progressed their team without having to draft too low on the board that they don’t have a player who can immediately show promise and hope. The Jazz knew they got a steal in the draft when Mitchell fell right to them, but I don’t think they knew what kind of player they would see in just his first year. Averaging 19.9 points per game, he is leading his team in offense and in just his first year in the league he is showing that he is the go to scoring guy for this offense. The Jazz knew his incredible leaping ability and athleticism when they drafted him out of the University of Louisville, but his growth in his overall game offensively is what is surprising me. He already has multiple 20 plus games under his belt, and a career high of 34 points on 73% shooting against the Sacramento Kings. His three point shot, while not a reliable option is a nice and complimentary 34 percent on the season, which is not bad given a first year player playing big minutes. He can continue to develop his three point game while still relying on his speed and jump to help cover up his holes in his game, and with him on the floor the Jazz have a higher ORtg (107.4) so they are better overall in one end with him driving and having control of the ball. The Utah Jazz are a team that has made a living and a name in making stars of out its young core of draft picks, and high end prospects. Gordon Hayward may have left a sour feeling in Jazz fans mouth when he left, but there was no arguing in that he made into a star with the Jazz, and it showed the maturation process of the team. 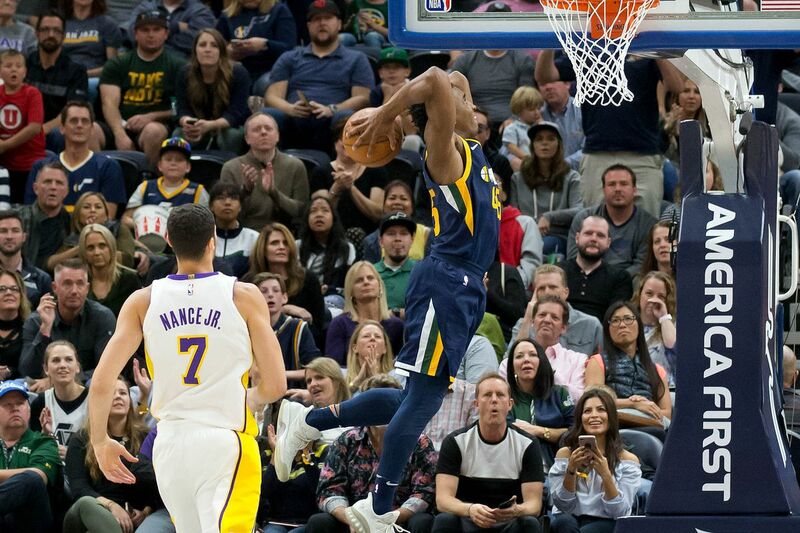 Derrick Favors is still rocking it with the Jazz, and has made into a nice role player for them alongside other prospect turned star in Rudy Gobert. The Jazz may have lost a player for the now in Gordon Hayward, but if recent history with the Jazz and its picks have shown us, Donovan Mitchell is going to work out just fine, and the Jazz giving up something in the now for something that may be better in the future might just be what they need to become real life contenders. Youth in this NBA day and age is as important as three point shooting, and the Jazz are a team built around leaning on its young stars to help lead the team and to help lead a promising future. Donovan Mitchell has shown he is the leader of this youth movement in Utah, and if his dunking performances are to grow, he is the next real human highlight reel that hasn’t been seen since Jason Richardson.